An ATM card (also known as a bank card, client card, key card, or cash card) is a payment card provided by a financial institution to its customers which enables the customer to use an automated teller machine (ATM) for transactions such as: deposits, cash withdrawals, obtaining account information, and other types of banking transactions, often through interbank networks. For many bank accounts, banks can issue you debit cards in the form of basic Automated Teller Machine cards -- ATM cards -- that let you obtain 24 hour access to money in your bank account through ATM cash machines, or more sophisticated bank debit cards that let you use ATM machines plus use your bank debit card for purchases. When you use a bank debit card, funds come directly out of your bank account (just like writing a check). Because ATM card withdrawals and bank debit card purchases are listed on your monthly statement, you can track your spending. Certain bank debit cards may have the logo of a familiar credit card company on them. Do not be confused. These cards are designed to provide you the convenience of making purchases wherever such credit cards are accepted (millions of businesses worldwide), but the purchase amounts are subtracted directly from your bank account and listed on your monthly bank statement. Bank debit cards do not extend you credit or generate separate bills. They also do not help you build a credit record, which may be important if you intend to purchase a car or home. Your bank will provide you with a personal identification number (PIN) to use with your ATM card or bank debit card, which is essentially a password for electronic access to your bank account. With your ATM card or bank debit card and your PIN, you can withdraw cash, make deposits, or transfer funds between bank accounts, plus pay for retail purchases with certain cards. When you withdraw cash, some ATMs charge a fee if you are not a member of their network or are making a transaction at a remote location. ATMs must disclose the fee on the terminal screen or on a sign next to the screen. Report a lost or stolen ATM card or bank debit card to the issuer immediately. If you report an ATM card missing before it is used without your permission, you are not responsible for any unauthorized withdrawals. Federal regulations limit your liability to $50 if you report the loss within two business days after you realize your card is missing, and to $500 if you report the loss between 2 and 60 days. Under Federal law you could lose all the money in your bank account and the unused portion of your line of credit established for overdrafts if you fail to report an unauthorized transfer or withdrawal within 60 days after your bank statement is mailed to you. However, self-imposed industry rules limit your liability to zero if you report the loss within two business days, and to $50 if you report it more than two business days after realizing your card is missing. Purchases made with a bank debit card are handled in one of two ways: either you enter your personal identification number, as you would at an ATM, or you sign for the purchase, similar to a credit card transaction. Ask for a bank debit card that must be used with a PIN to make it harder for thieves to use your lost or stolen cards or account numbers. Keep your PIN a secret. Do not write your PIN on the card or on a slip of paper kept with your card. Take your ATM receipt after completing a transaction. Reconcile all ATM receipts with bank statements as soon as possible. When you use a bank debit card for purchases, these purchases will be shown on the periodic statement of your bank account. If there is an error on your account, contact your bank or the issuer of the card at the address or phone number the company provided. When you use an electronic funds transfer, federal law does not give you the right to stop payment. It is up to you to resolve the problem with the seller. Stored-value cards, issued by some financial institutions and merchants, contain cash value stored electronically on the card itself. Stored-value cards and the transactions you make using them may not be covered by the Electronic Funds Transfer Act, which means you may not be covered for loss or misuse of the stored-value card. In some banking networks, the two functions of ATM cards and debit cards are combined into a single card called simply as a debit card or also commonly called as bank card. These are able to perform banking tasks at ATMs and also make point-of-sale transactions, with both features using a PIN. Some debit card networks also started their lives as ATM card networks before evolving into full fledged debit card networks, example of these networks are: Development Bank of Singapore (DBS)'s Network for Electronic Transfers (NETS) and Bank Central Asia (BCA)'s Debit BCA, both of them were later on adopted by other banks (with Prima Debit being the Prima interbank network version of Debit BCA). Many card issuing banks issue prepaid Visa Inc. or MasterCard debit cards either directly or through Member Service Providers (MSPs). In order to compete, many of these organizations target specific markets, where they can differentiate their products. Payoneer pursues a number of markets by providing salary and commission payout solutions for industries like affiliate marketing, summer camps, freelancers, direct selling and clinical trials. Techcrunch described Payoneer as a competitor to Paypal, having an "advantage over Paypal in the micro-payments arena" because "it makes international payments easier by not requiring a bank account for verification." According to The New York Observer, a large share of the traffic to Payoneer's web site comes from Russia and Central Asian countries like Kyrgyzstan, Uzbekistan and Kazakhstan. Payoneer has a partnership with the freelance-marketplace firm Guru.com; 85% of Guru.com pay card holders are from outside USA. Payoneer provides several electronic payment services. 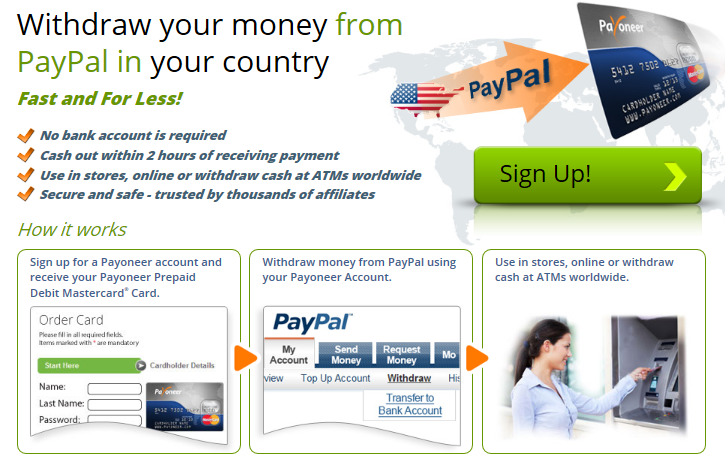 Debit MasterCard; A prepaid debit card accepted in 210 countries. Virtual Card; Virtual card is a non-physical card that allows payments online or mail order. The Payoneer Travel Prepaid MasterCard is a prepaid card accepted in multiple locations worldwide, where debit MasterCard is accepted. Travelers can use the card at a point of sale location to make purchases and at an ATM to withdraw cash. The Payoneer Prepaid MasterCard can be used for online transactions whenever a debit MasterCard is an acceptable form of payment.